Driving few minutes away from Ancona city center on the Rosso Conero road immersed among wheat fields, brooms and lavender you will reach Portonovo. This lovely bay will be able to make you fall in love from the first sight. Starting to go down the gentle curves that will take you to the beaches you can enjoy breathtaking views with the green of Conero Park overlooking the crystal blue sea. Rewarded for several years with the important recognition of the Blue Flag, its beaches shape a strip of white pebbles which divides the blue sea by the green of Conero creating a harmony of colours and unique nature. Thanks to the favorable wind conditions Portonovo is one of the best spots for windsurfing in the whole Adriatic Coast. Portonovo is not only sea. Its beaches tell us ancient and fascinating stories. This is the case of the medieval Church of Santa Maria di Portonovo. Few steps away from the sea it is a Romanesque jewel of striking beauty built by Benedictine monks in 1034 with the characteristic white Conero stone. 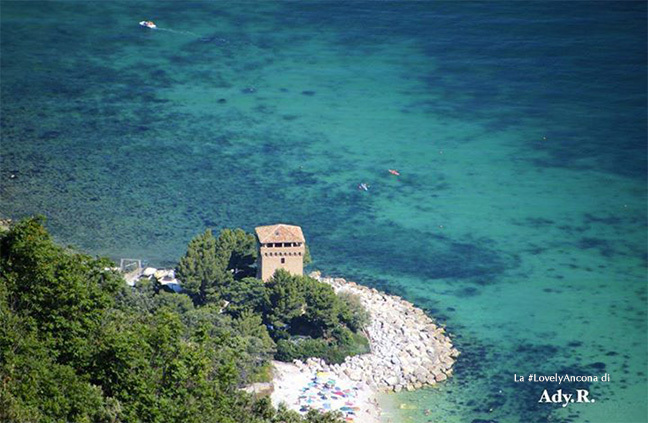 Another historic place is La Torre Clementina (or Watchtower). Built in 1716 as a defense against pirates during the years it ceased to be a military site to become a place loved by many poets as Lauro de Bosis and the famous Gabriele D’Annunzio. Finally you should visit Il Fortino Napoleonico, built in 1810 during the reign of Napoleon in Italy with the aim to prevent the landing of the British fleet in search of drinking water; today is an elegant Hotel. Stop to enjoy your dinner on a table by the sea to delight a traditional dish completed by a glass of wine while enjoying the sound of the sea and the starry sky above you.